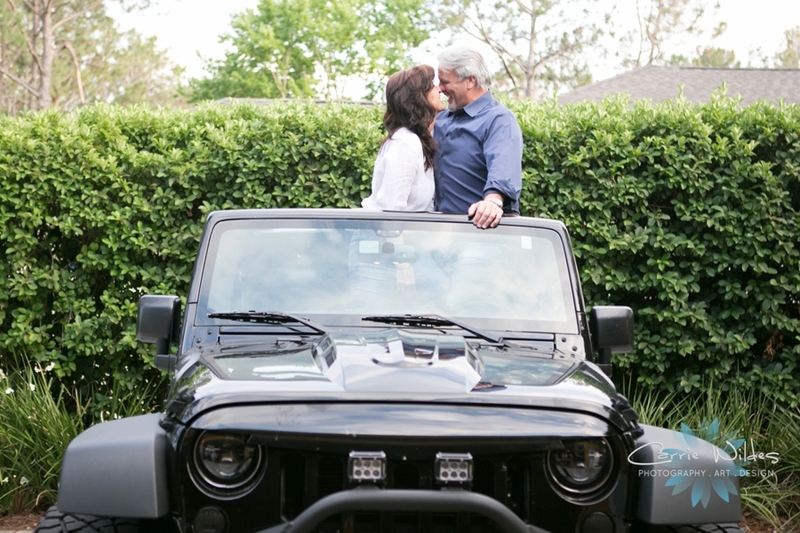 Valerie & Bob were winners of a fun little engagement session contest we did this fall. 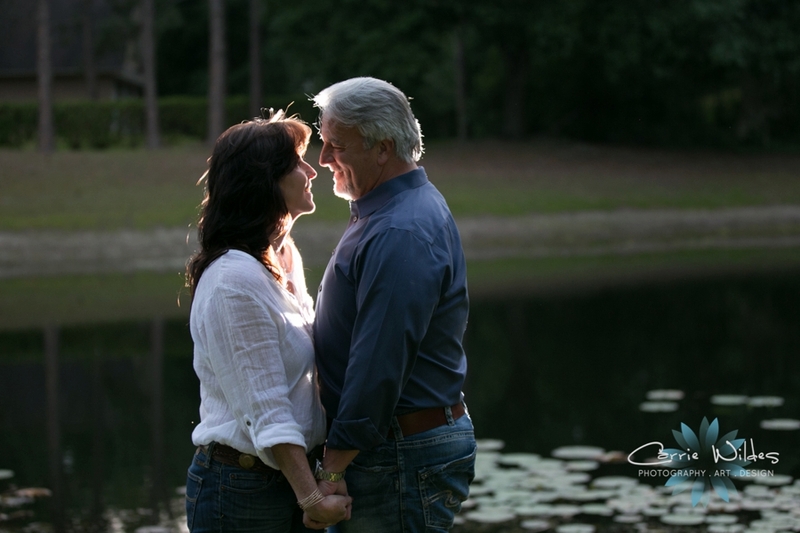 The goal was to do some different and creative engagement sessions that are totally these couples. They told me one of their favorite things to do is watch Netflix and hang out with their sweet pup Patty so that’s what we did! They jumped in their PJs and flipped on the Office. Bob said the screenshot of Pam is perfect because he always says Valerie is his Pam. 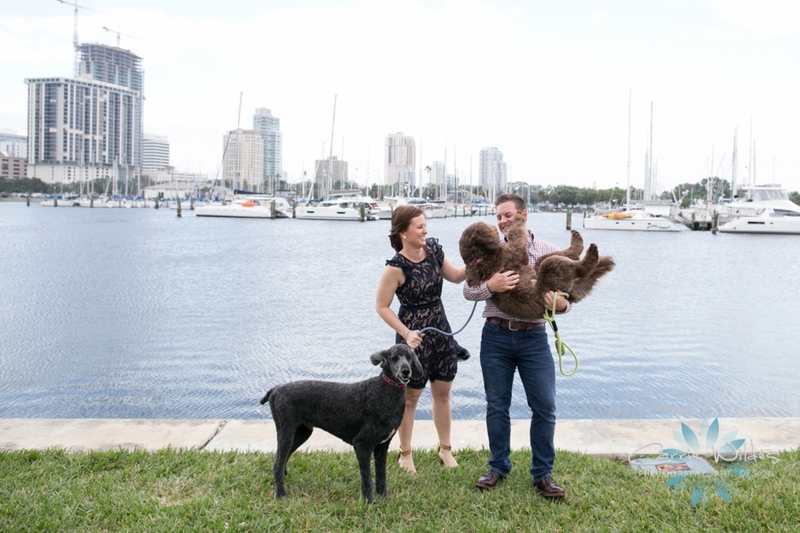 Patty is so cute and very photogenic as you will see…..
Valerie and Bob love to hang out at Ballast Point which is super close to where they live so we headed there close to dusk and the light was perfect, you can even see downtown Tampa in the background. When I saw them yesterday for their unveiling session I found out that we had done Bob’s sister’s wedding (Robin and Armen) 4 years ago, how fun is that? 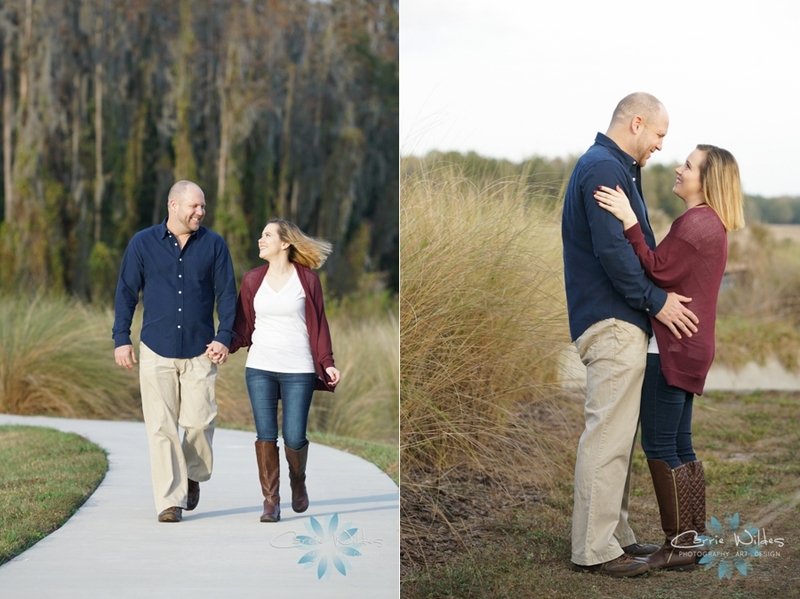 We did a little engagement session contest in October and Becca and Pete were one of our couples who one! It was all about doing something different and fun and we totally did! Becca picked some of the cool art murals in St. Pete, although some of them were not the same as on the map but all turned out really cool:-) Pete is a musician who rarely wears shoes and Becca taught him how to longboard. While we we walking around Pete noticed a giant mural of bunnies and they happen to have pet bunnies so it was perfect! Once the sunset we had a little fun with the citrus mural and even caught the moon in a few! Jen and Daniel and so funny and sweet, I loved photographing their engagement session! An extra cool fun fact is that we photographed Daniel's sister, Rachel's wedding 7 years ago:-) Jen made AMAZING outfit choices the gray and blue looked gorgeous with the brick and architecture at UT. The gray railings even matched perfectly. There's a dock the rowers use right on the Hillsborough river and it is such a fantastic view of the city, similar to the views they had when they lived downtown. After dusk we headed over to the front steps of the Le Meridien which was the historic courthouse built in 1905. Daniel is an attorney so totally his stomping ground. You can't get any more Tampa than the Tampa Theater. So that was our last stop doing some fun artsy lighting. 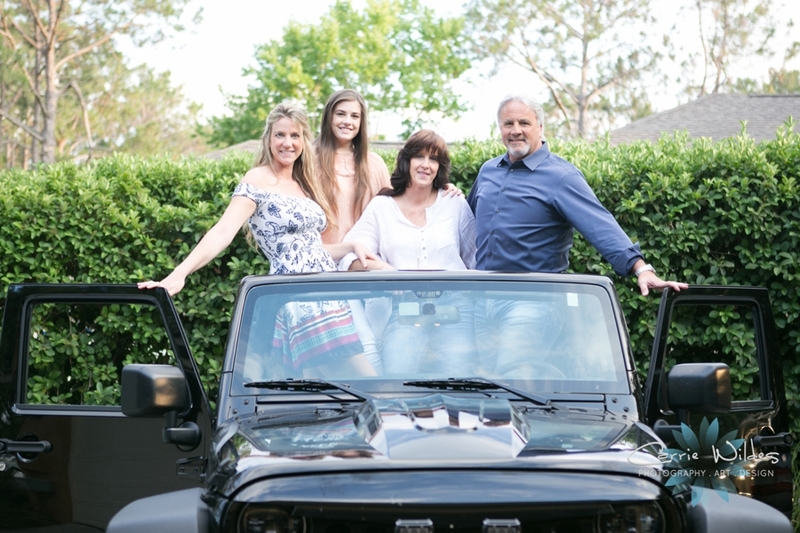 Julie and Charlie met while working for a small cruise line both of them in training to be cruise directors, how fun is that? Charlie loves all things Chicago, especially the Bears and Julie loves UF football! 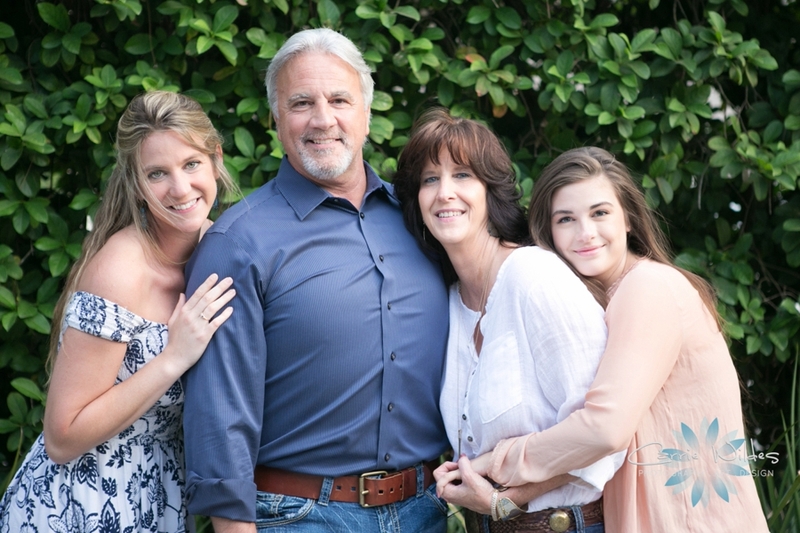 They are obsessed with their adorable pup, Cooper, and so we of course had to include him in their engagement session. 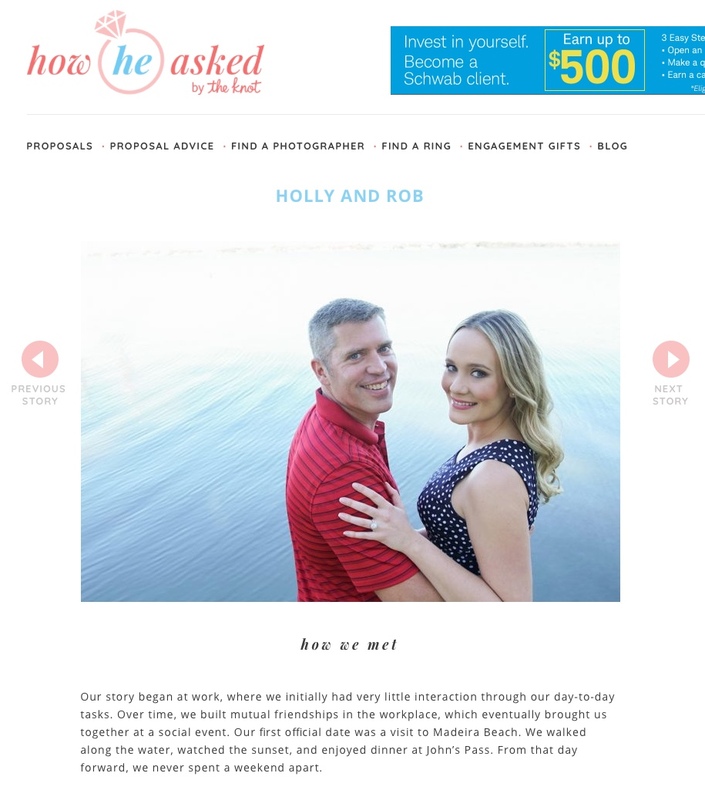 Their wedding colors are navy and mint, and after some fun ones in their favorite jerseys, Julie changed into a flowy navy dress and Charlie a mint shirt and navy pants which looked so amazing with the sailboats and all the greenery ending with a gorgeous sunset! We can't wait until 8.4.18 when they say "I do"!!! 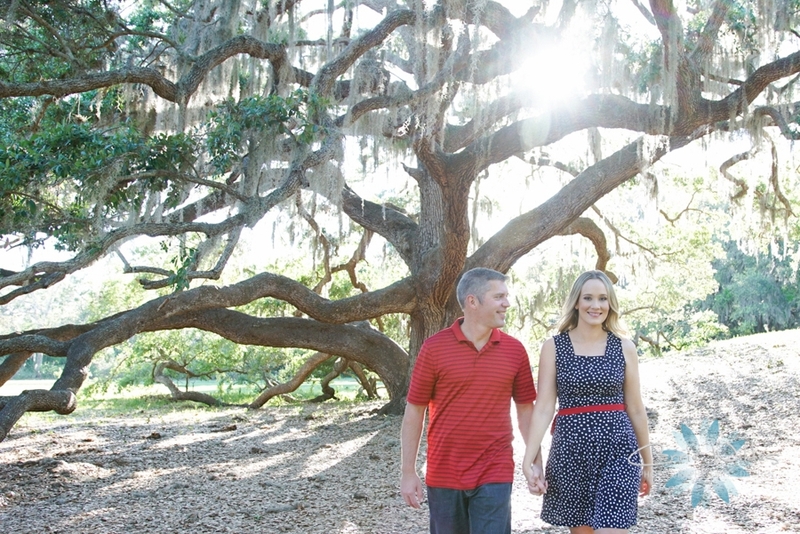 Marlaina and Tyler are getting married at the beautiful Bakers Ranch next February. 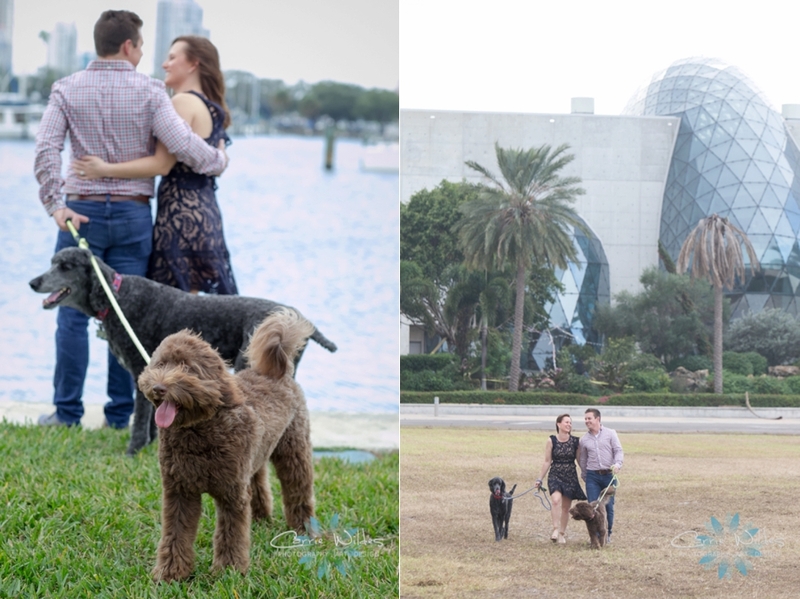 They wanted to have their sweet puppy Tigger in some photos with them for their save the date on the property so their guests would already have an idea of the location. It had literally just poured a little while before their session but the rain really makes the greenery pop. It was a little before dusk so we still have the pretty natural light but you can see the market lights in the background. I'll have to blog their save the date as well it turned out so cute! 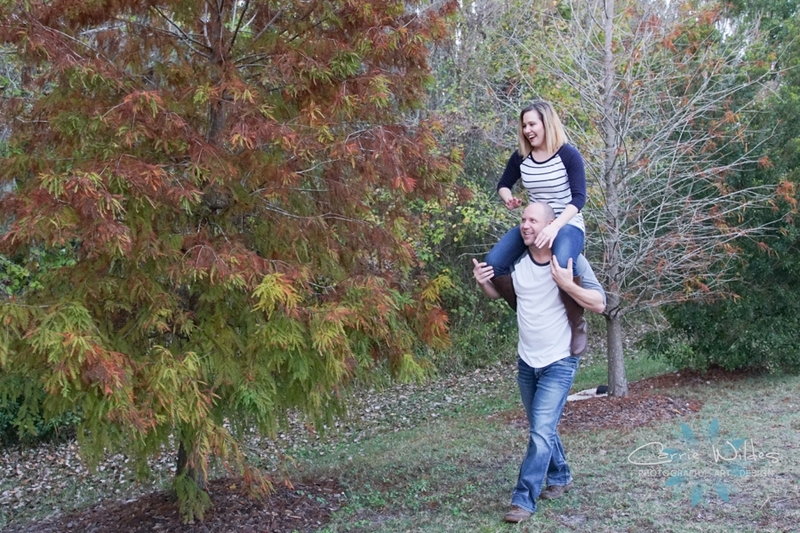 This happens to be one of the most fun engagement sessions ever! When I met with Christine, she happened to tell me that her and Matt have a 1950's vintage tandem bicycle they are restoring together. 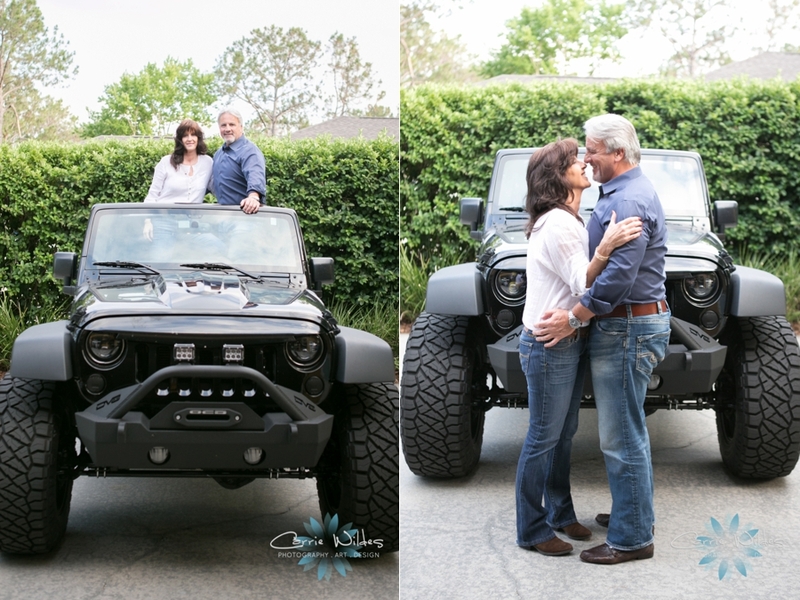 It was pretty easy to decide what to do for their engagement session after that! 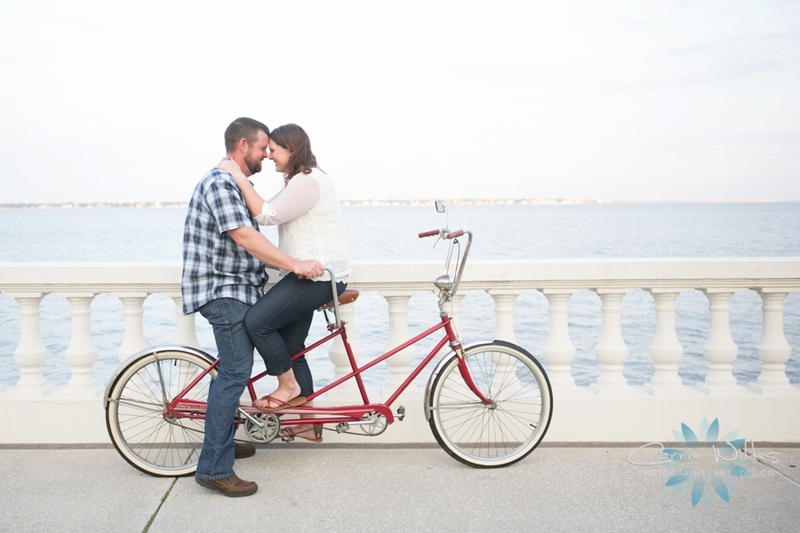 We may have wreaked a little havoc on Bayshore but it was so much fun:-) They are going to have some bicycle accent details at their wedding and all their favs from this session are going to be designed into a custom sign in book. 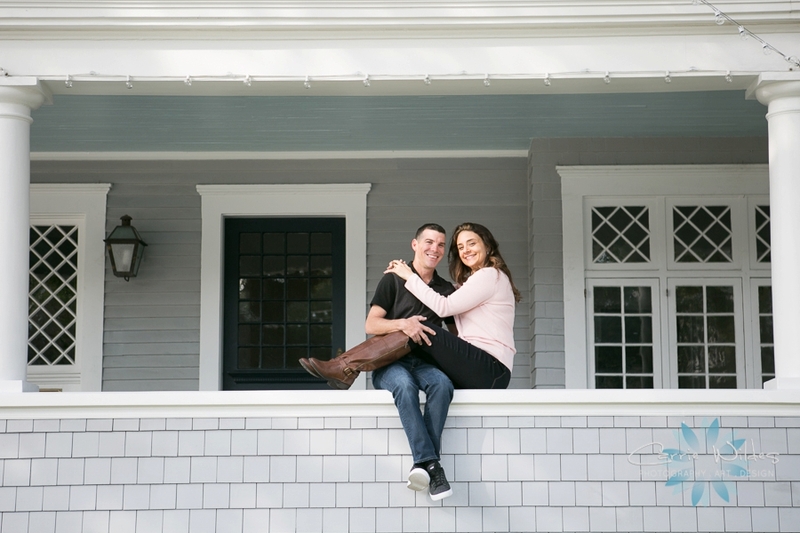 We can't wait to photograph their wedding 4.25.18! !